Product #18288 | SKU SP32106 | 0.0 (no ratings yet) Thanks for your rating! 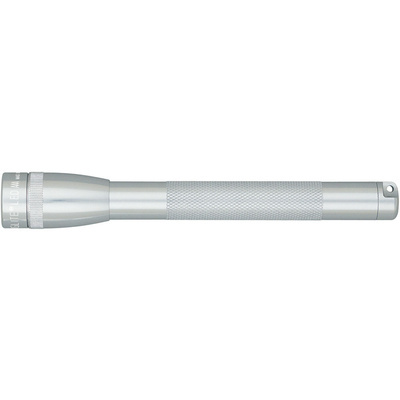 The silver Mini Maglite AAA LED Flashlight from Maglite is a compact illumination tool that provides impressive brightness for its pocket-sized form factor. An 84-lumen LED light source produces a beam visible at a range of 127 yards. This AAA battery version of the Mini Maglite has a slimmer silhouette than its AA counterpart, and it also weighs less than two ounces. Like other Maglites, the Mini is machined from a lightweight aluminum alloy, anodized inside-and-out for enhanced corrosion-resistance, and manufactured in the United States. A weather-resistant housing and adjustable beam width help make the AAA configuration of the Mini Maglite both easy to use and built to last.